Secretary General of the United Nations Antonio Guterres addresses the Security Council at the United Nations Headquarters in New York, Aug. 29, 2018. The U.N. secretary-general has welcomed an agreement reached Monday between the presidents of Russia and Turkey to create a demilitarized buffer zone in Syria's Idlib region, saying it should "avert" a full-scale military operation and provide a reprieve for some three-million civilians. "The secretary-general calls on all the parties in Syria to cooperate in the implementation of the agreement and ensure safe and unimpeded humanitarian access in all areas through the most direct routes," António Guterres' spokesperson said in a statement Tuesday. Russian President Vladimir Putin, left, and Turkish President Recep Tayyip Erdogan wait to enter a hall during their meeting at the Bocharov Ruchei residence in the Black Sea resort of Sochi, in Sochi, Sept. 17, 2018. 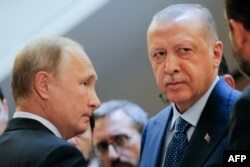 ​Russian President Vladimir Putin and Turkish President Recep Tayyip Erdogan agreed Monday to create a 15- to 20-kilometer (9- to 12-mile) demilitarized zone inside what is already a de-escalation zone. Putin said Russian and Turkish forces would enforce the demilitarized zone, which would see the removal of the rebels' heavy weapons and the "withdrawal of all radical fighters" from Idlib, including the terrorist al-Nusra Front, by mid-October. The United Nations has been sounding the alarm bell on Idlib for weeks, warning of a humanitarian catastrophe if the Syrian government followed through on its plans to clear the last rebel stronghold. The U.N. estimates some 15,000 fighters are mixed in among the civilian population. More than a million of Idlib's residents are displaced from other parts of Syria and have sought safety in the de-escalation zone. Turkey, which already shelters more than 3 million Syrian refugees, feared a massive exodus into its territory if nearby Idlib was attacked. A general view of a camp for internally displaced persons, in Atimah village, Idlib province, Syria, Sept. 11, 2018. "Of course, everybody, especially the 3 million civilians in Idlib, want to know how long this agreement is going to last," U.N. humanitarian chief Mark Lowcock told reporters. "Is it simply a temporary arrangement or can it provide the basis through which the threat of a massive military onslaught on Idlib can be removed on a more permanent basis?" "Russia alongside other Astana guarantors has and continues to undertake tremendous efforts to see that situation around Idlib resolved through negotiations and that civilians will not suffer," Russia's U.N. envoy, Vassily Nebenzia said. Russia, Iran and Turkey make up the group referred to as the Astana guarantors. They oversee what were originally four de-escalation zones in Syria, but of which Idlib is the last remaining. Nebenzia, who spoke during a regular meeting of the Security Council on Syria, added that a key part of the deal is a reaffirmation "to combat terrorism in Syria in all of its forms and manifestations." The newly appointed U.S. Special Representative for Syria Engagement, Ambassador James Jeffrey, called on all parties to commit to a lasting cease-fire and to take immediate steps to advance the peace process. "The only way forward is a genuine and inclusive political solution," Jeffrey told the council. 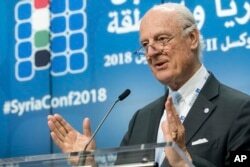 U.N. Special Envoy of the Secretary-General on Syria Staffan de Mistura addresses the media during a conference 'Supporting the future of Syria and the region' at the EU Council in Brussels, April 25, 2018. "We hope that this agreement is expeditiously implemented," U.N. Syria envoy Staffan de Mistura said in his briefing to the council. He said international humanitarian law must be respected and sustained humanitarian access allowed. But he warned that as the crisis in Idlib has been averted, there have been worrying escalations elsewhere. "This week fresh airstrikes were reported in Damascus that the Syrian government attributes to Israel; Israel has not commented," de Mistura noted. "And overnight, a Russian military aircraft was downed, killing 15 servicemen." The Russian jet was hit by Syrian anti-aircraft fire. Russia-Turkey Deal Averts Catastrophe in Syria, But for How Long? ​Israel has expressed "sorrow" for the downing of the Russian jet, but added that it holds the Syrian regime of Bashar al-Assad, Iran and the Lebanese militant group Hezbollah responsible for the incident. "Overnight, Israel Defense Forces fighter jets targeted a facility from which systems to manufacture accurate and lethal weapons were about to be transferred on behalf of Iran to Hezbollah in Lebanon," an Israeli military spokesperson said in a statement.